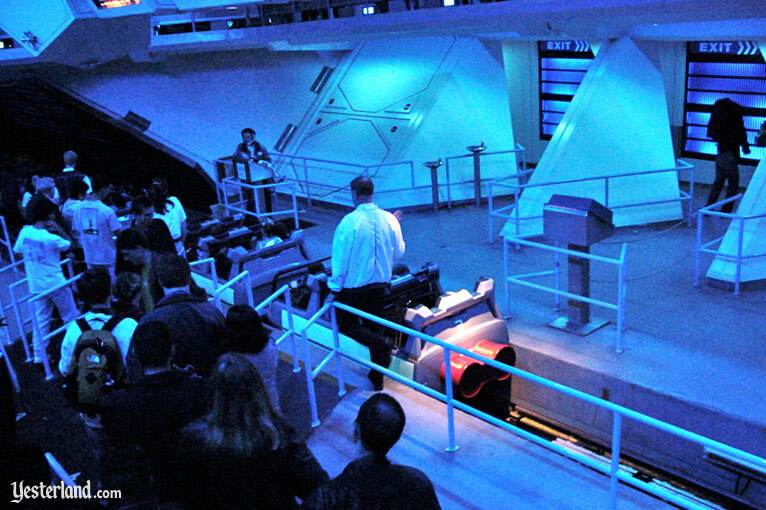 Space Mountain lets you travel through space inside a structure that futurists H.G. Wells, Jules Verne, and Leonardo da Vinci might have imagined. This giant copper kettle with a green patina represents an ingenious relic from a much earlier era. 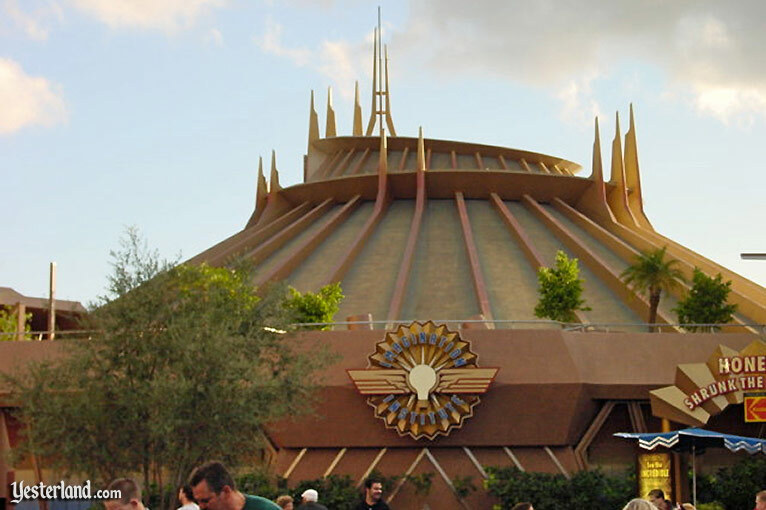 Pay no attention to anyone who claims that this Space Mountain looks as if it suffered from a massive spill of vomit—or something worse—all over its exterior. Okay, okay. It doesn’t really look like copper or bronze. But pretend that it does. And try to like it. 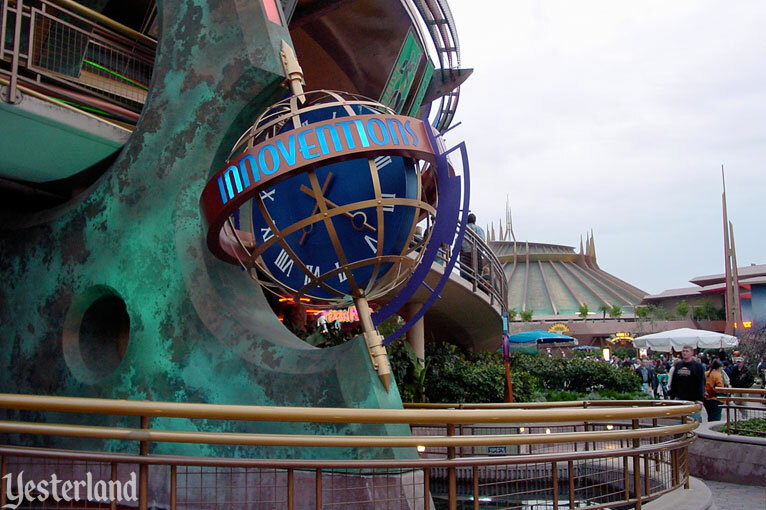 After all, colors like this are all over this version of Tomorrowland. Let’s take a ride! 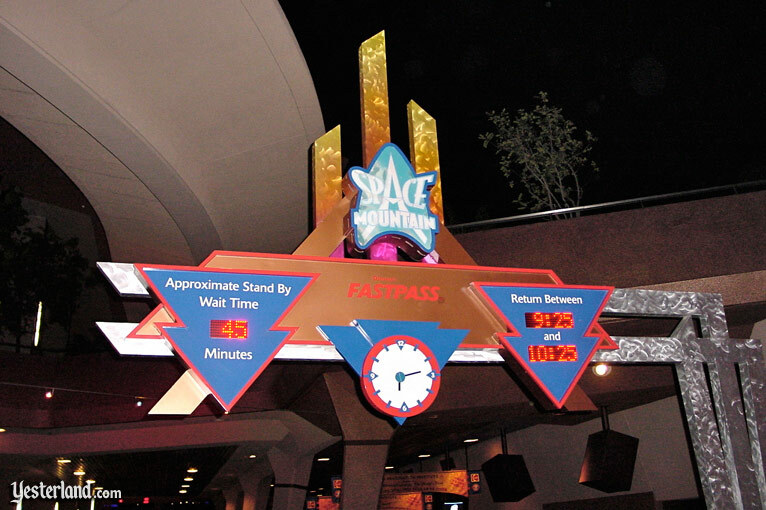 Grab your FASTPASS. Then follow the queue. Monitors keep you entertained while you wait. 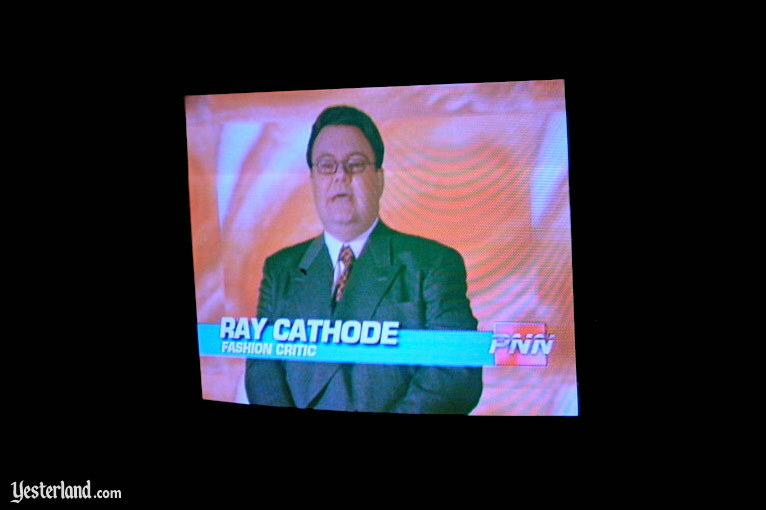 In one segment, Ray Cathode (played by Glenn Shadix) tells you, “The hot news at the Mars shows is color.” He’s talking about fashion, not the hues of Space Mountain. 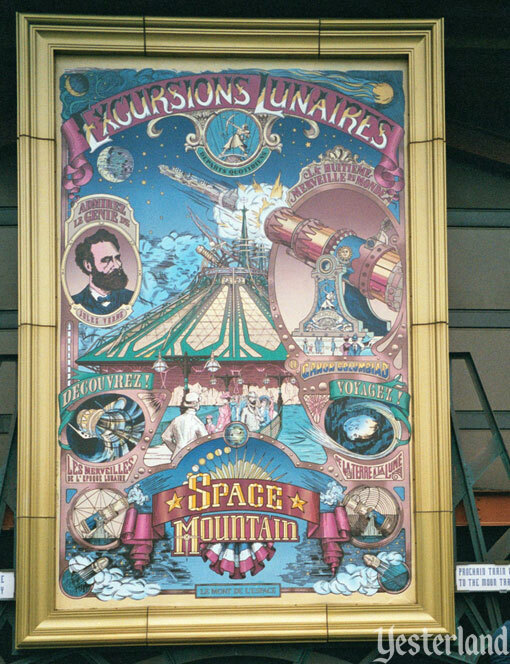 When you actually get to the loading area, there’s no indication of the Jules Verne future. Enjoy the ride! It looks better at night. 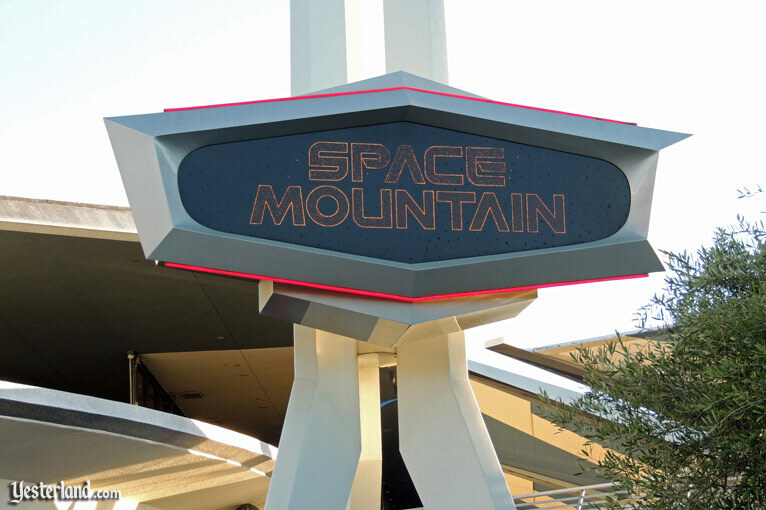 Space Mountain opened at Disneyland in 1977. The indoor roller coaster would be housed in a gleaming white structure for more then 20 years. 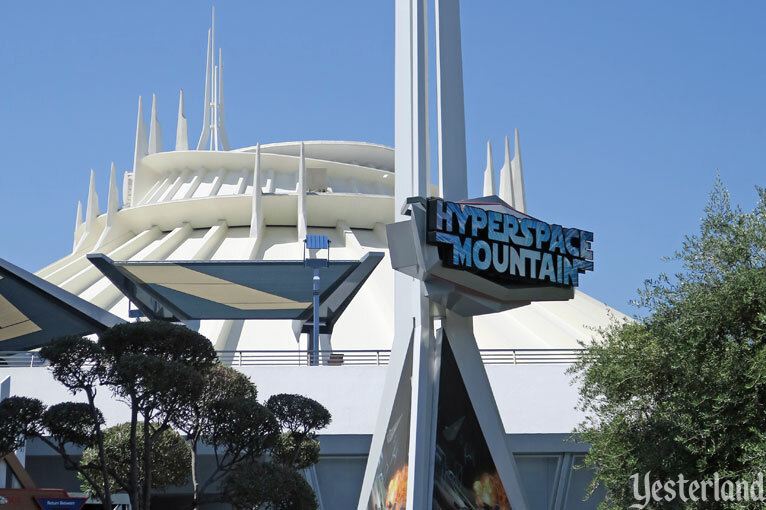 Space Mountain had been designed to fit into the New Tomorrowland of 1967—which had replaced the original Tomorrowland just 12 years after the opening of the park. 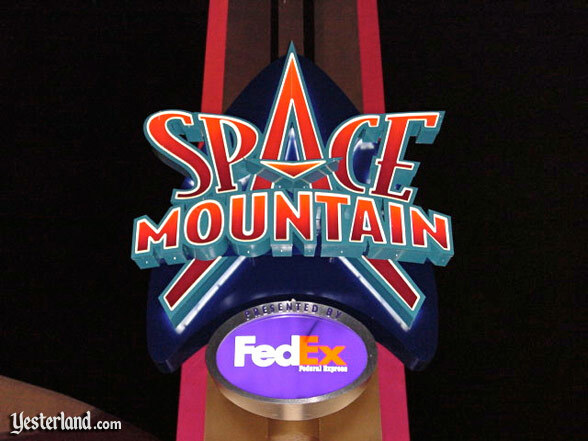 In 1995, Federal Express (FedEx) became the sponsor of Space Mountain, a relationship that would last ten years. With the sponsorship came a more entertaining queue and new displays. 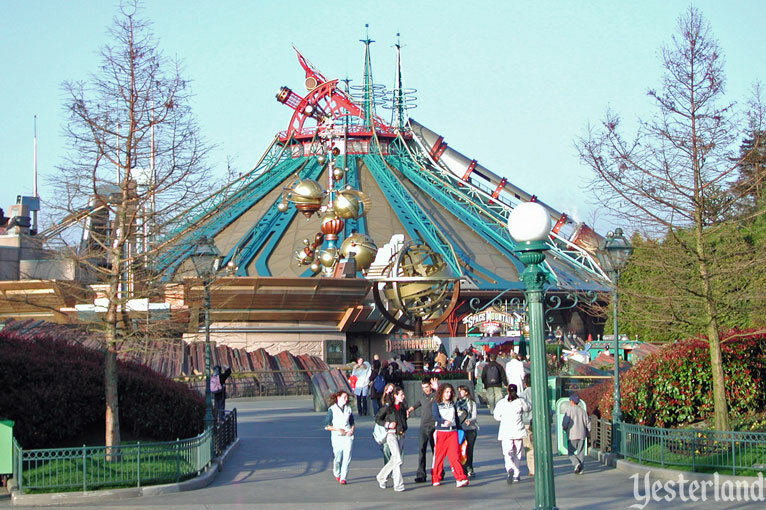 In 1998, the exterior of Space Mountain was given a brownish, greenish, copperish paint job as part of a new New Tomorrowland project. It must have seemed like a good idea at the time. 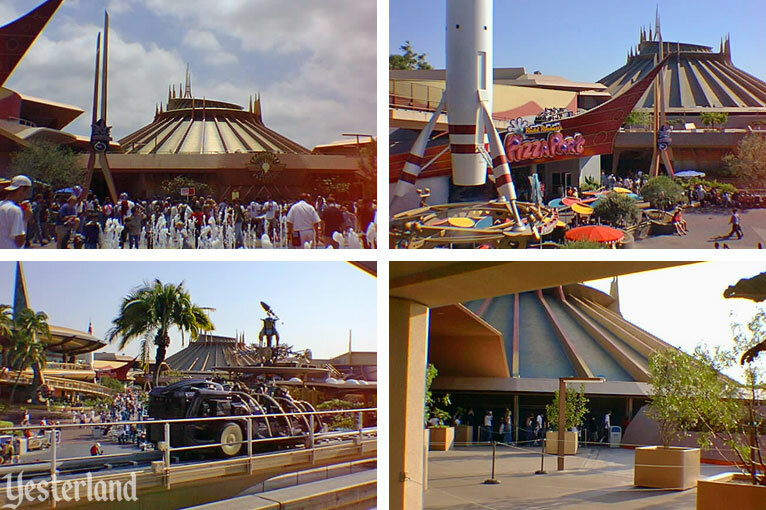 It had been 31 years since the last New Tomorrowland—and this “World of Tomorrow” was anything but futuristic. 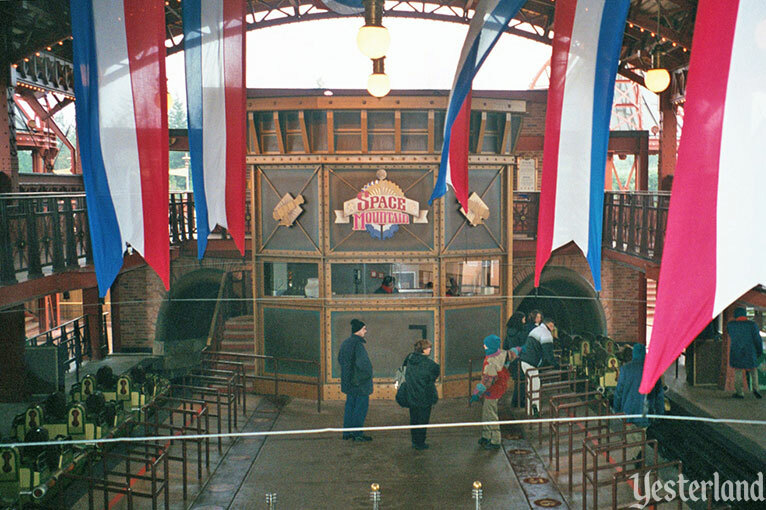 To make matters worse, America Sings (1974) had been silenced in 1988 and Mission to Mars (1975) was decommissioned in November 1992, leaving two highly visible attraction buildings behind. The executives in charge of Disney’s theme parks learned important lessons from Disneyland Paris, which had opened in 1992 as Euro Disney. One of these was that a retro-future theme solves the problem of trying to stay ahead of the actual future. Another was that capital spending needs to be kept under control to avoid the red ink that plagued the Parisian park. While Disneyland Paris had retro-future architecture, the original Disneyland would try to accomplish the same thing primarily with paint. 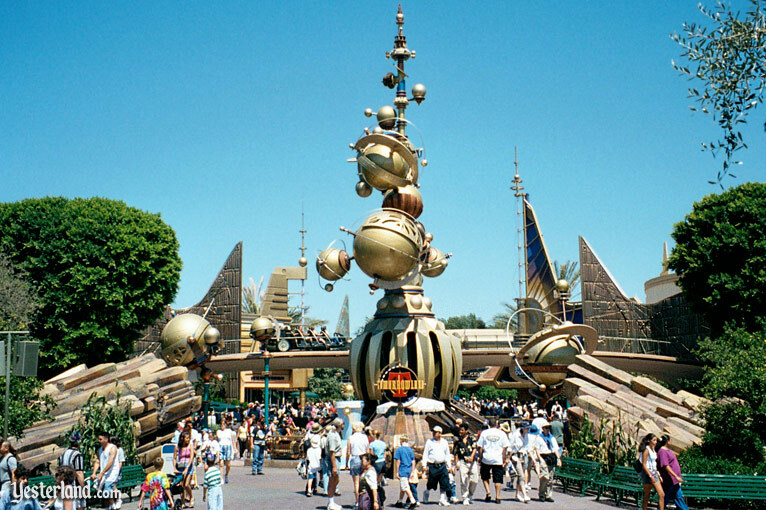 Disneyland would get a retro Tomorrowland on a tight budget. Disneyland has abandoned the idea of predicting the future in favor of bringing to life the dreamlike visions of Leonardo da Vinci and Jules Verne. 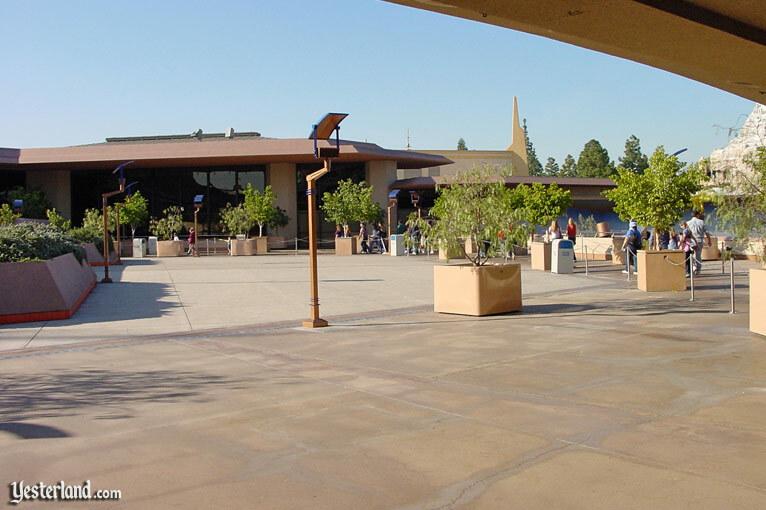 So the stark, sleek look is gone, replaced by golds, browns and cobblestone walkways. 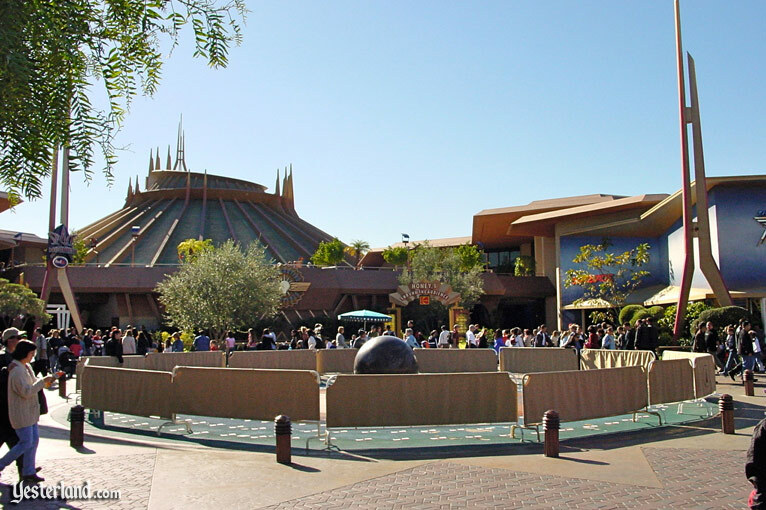 But the new Tomorrowland is not really earth-bound. Like the old version, it spends a great deal of time sending its visitors into space. 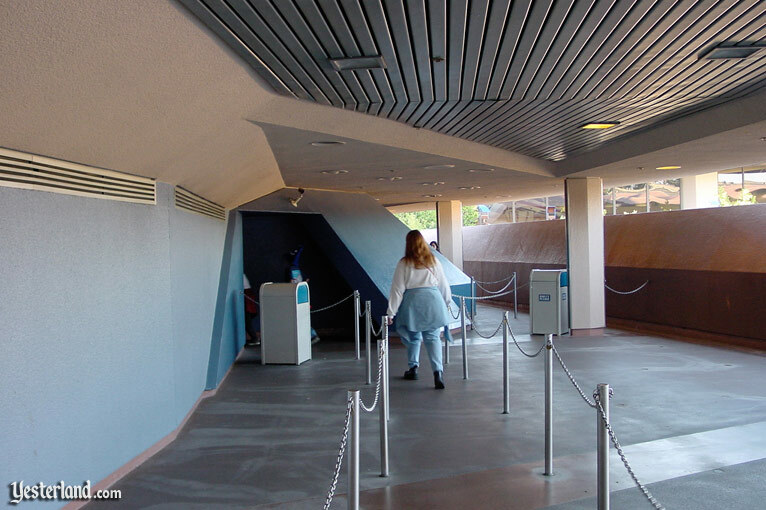 And here the design scheme is now much less the Jetsons-style sleekness of the old Tomorrowland and oddly more retro. 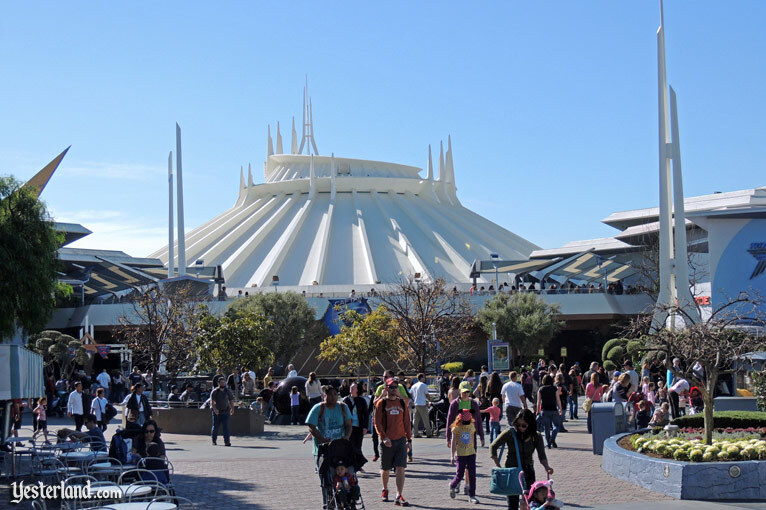 Space Mountain, a roller coaster meant to give the sensation of hurtling through space, remains, but its tall exterior is repainted, curiously, to look like greenish, oxidizing copper. The intention: earth-friendly. The effect: grunge. The grunge look did not suit Space Mountain. 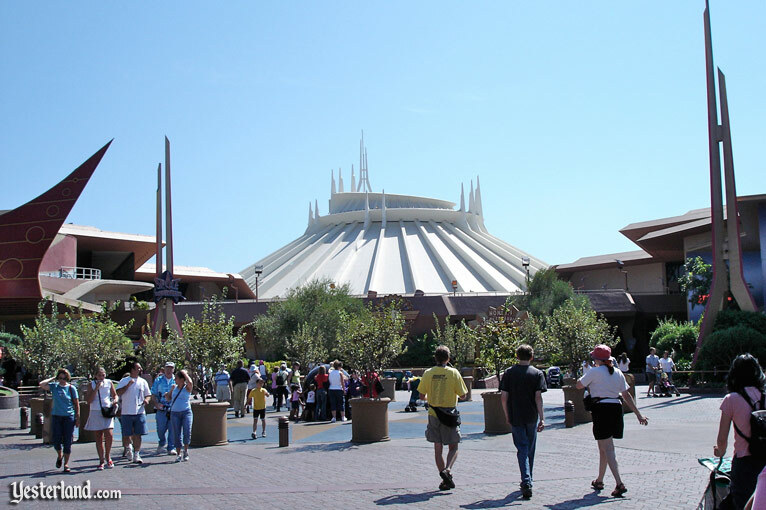 In 2003, Space Mountain was restored to its original white color. The rest of Tomorrowland followed with a new palette of silver, grays, and blues. 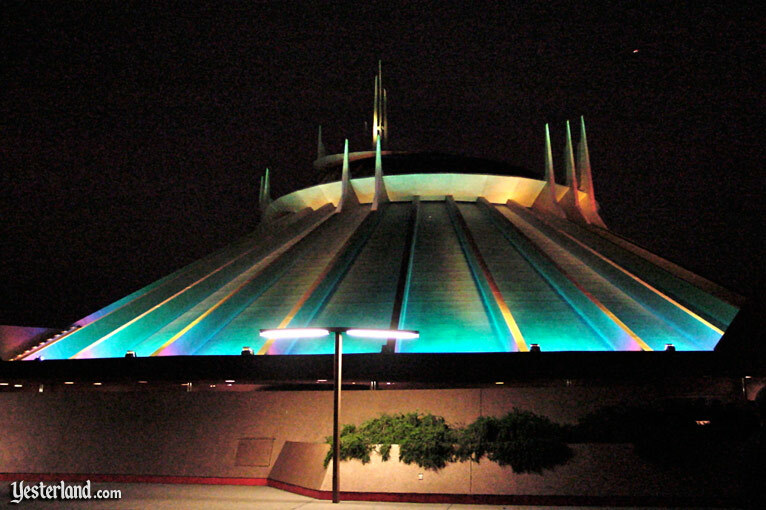 By now, it’s hard to remember that Space Mountain was ever a color other than white.